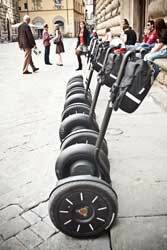 Moving around the streets of Florence in segway, represents a different, new and funny way to visit the city centre, shifting from side to side of the pedestrian area, effortlessly and while enjoying the artistic and cultural atmosphere that is possible to breathe in the city. 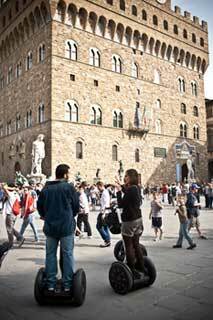 About Florence tested for you the guided segway tour!!! Equipped with cameras to fix our adventure, we started our tour in the streets of the city, assisted by a professional guide who explained details of the history and curiosities about major attractions situated in the historical city centre. It was an extremely exciting and interesting experience, even for those accustomed to live Florence all year round. Even if easy to use, it is necessary to take part to a brief training before putting your feet on a segway, in order to get a feeling with the two wheels and learn to control them at best. After about twenty minutes the tour starts with a first stop in Piazza San Giovanni, to its Cathedral of Santa Maria del Fiore (better known as the Duomo), to the Giotto Bell Tower and to the Baptistery entitled to San Giovanni Battista, patron of the city. From piazza Duomo we move in via Martelli to admire the awesome Palazzo Medici Riccardi, current seat of the provincial council. Going back from there and passing through part of the prestigious Via Roma, we reach Piazza della Repubblica (the most famous work resulting from the city improvement – also called Risanamento – initiated during the brief period when Florence was the capital of a reunited Italy, in 1865) and piazza Strozzi then, where the famous palazzo Strozzi is located, a palace that hosts today, many exhibitions of modern and contemporary art. From Piazza Strozzi, we continue through via Porta Rossa – where a few minutes stop is also expected for a brief presentation of Palazzo Davanzati – up to the Loggia del Mercato Nuovo, also called Loggia del Porcellino, that takes its name from the Porcellino Fountain: a bronze boar realized by the artist Pietro Tacca and famous all over the world as a sort of lucky mascot. Following stages are represented by Piazza della Signoria (with the current town hall of Palazzo Vecchio and the Loggia della Signoria, or Loggia dei Lanzi, hosting some of the most important and representative statues of the city), the Georgofili Accademy (notorious because of the massacre operated by the Mafia that took place on May 27, 1993) and Piazzale degli Uffizi. Then, we change district and after a refreshing break with talking and drink, we cover the entire perimeter of Piazza Santa Croce, in function of a stop in front of the Basilica and we leave one more time in direction Piazza San Firenze, to admire from outside, the structure of the tribunal and the Bargello museum, one of the most important museums in Florence. Last stop: via Santa Margherita, seat of the Museum Casa di Dante – the place where the poet would have met for the first time his b	eloved Beatrice Portinari – situated in one of the most ancient areas of the city centre. With a significant amount of video and photographic material we return to base, enriched by such a funny experience considered to be very positive and exciting by all participants! For those who wish to visit the city with an unconventional and very comfortable method at the same time, we surely suggest this guided segway tour, an undoubtedly fascinating experience! Follow the segway photographic tour on flickr! 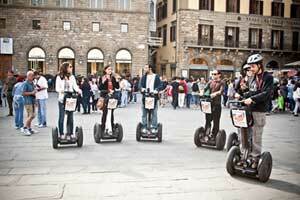 A comfortably tour organized with Segways! An alternative way to visit Florence, with a coach tour. It's like a private tour, to visit (exterior only) all the important areas of Florence while listening an audio-guide.